Bournemouth thrashed Dagenham & Redbridge to reach the Carling Cup second round. Marc Pugh fired in the opener from a deflected 25-yard free kick and Shaun Cooper added a second with a low rifled shot from the edge of the area. After the break, Liam Feeney latched onto Pugh's fine pass and finished from six yards out. Taylor then scored a late double, first finishing from Jayden Stockley's header and then burying a pass from Pugh. Signed from non-League side Concord Rangers just under a year ago, Taylor had not found the net in his 13 previous appearances for the Cherries, which had mostly come from the bench. 90:00+4:03 The game is over, as the referee blows his whistle. 90:00+3:52 Free kick awarded for a foul by Steven Gregory on Abu Ogogo. Abu Ogogo takes the direct free kick. 90:00+2:46 Assist by Marc Pugh. 90:00+2:46 GOAL - Lyle Taylor:Bournemouth 5 - 0 Dag & Red Lyle Taylor fires in a goal from inside the penalty area to the bottom left corner of the goal. Bournemouth 5-0 Dag & Red. 90:00+2:41 The ball is swung over by Warren Cummings. 89:41 Warren Cummings fouled by Jon Nurse, the ref awards a free kick. Warren Cummings takes the direct free kick. 88:12 Foul by Liam Feeney on Oluwafemi Ilesanmi, free kick awarded. Direct free kick taken by Danny Green. 87:58 A cross is delivered by Danny Green. 87:21 Assist by Jayden Stockley. 87:21 GOAL - Lyle Taylor:Bournemouth 4 - 0 Dag & Red Lyle Taylor scores a goal from close range low into the middle of the goal. Bournemouth 4-0 Dag & Red. 86:58 Liam Feeney produces a cross, Jayden Stockley has a headed effort at goal from just inside the box that bounces off the post. 86:21 Centre by Danny Green, Darryl Flahavan makes a save. 83:00 Warren Cummings fouled by Jake Reed, the ref awards a free kick. Darryl Flahavan restarts play with the free kick. 82:38 Liam Feeney takes a shot. Mark Arber gets a block in. 81:16 Jayden Stockley concedes a free kick for a foul on Damien McCrory. Scott Doe takes the direct free kick. 79:55 Elliot Ward has an effort at goal from outside the box which goes wide right of the target. 79:42 Elliot Ward takes a shot. Blocked by Mark Arber. 78:44 The ball is swung over by Jon Nurse. 77:59 Liam Feeney sends in a cross. 76:44 Substitution Brian Woodall replaces Sam Williams. 76:09 Liam Feeney produces a cross. 75:14 James Shea takes the direct free kick. 75:14 Substitution (Bournemouth) makes a substitution, with Elliot Ward coming on for Mark Molesley. 75:14 Jayden Stockley challenges Mark Arber unfairly and gives away a free kick. 72:48 Substitution Warren Cummings is brought on as a substitute for Scott Malone. 70:35 Jake Reed produces a right-footed shot from the edge of the area and misses to the left of the target. 70:32 Centre by Jon Nurse. 70:05 The official flags Lyle Taylor offside. Free kick taken by James Shea. 69:28 Substitution (Dag & Red) makes a substitution, with Danny Green coming on for Gavin Tomlin. 68:02 Booking Booking for Luke Howell. 67:53 Booking Mark Molesley is given a yellow card. 67:06 Sam Williams takes a shot. Save by Darryl Flahavan. 65:58 Effort from long range by Sam Williams goes wide right of the target. 65:20 Nathan Byrne has an effort at goal from outside the box which goes wide right of the goal. 64:11 A cross is delivered by Jon Nurse, Nathan Byrne gets a block in. 62:57 Substitution Jayden Stockley on for Steve Fletcher. 61:30 Foul by Sam Williams on Shaun Cooper, free kick awarded. Darryl Flahavan takes the free kick. 60:31 Inswinging corner taken from the right by-line by Damien McCrory. 60:26 The ball is crossed by Gavin Tomlin, Scott Malone gets a block in. 58:58 Foul by Mark Arber on Steve Fletcher, free kick awarded. Free kick taken by Darryl Flahavan. 58:53 The ball is sent over by Oluwafemi Ilesanmi, Mark Molesley makes a clearance. 56:19 Assist on the goal came from Marc Pugh. 56:19 GOAL - Liam Feeney:Bournemouth 3 - 0 Dag & Red Liam Feeney fires in a goal from close in to the bottom left corner of the goal. 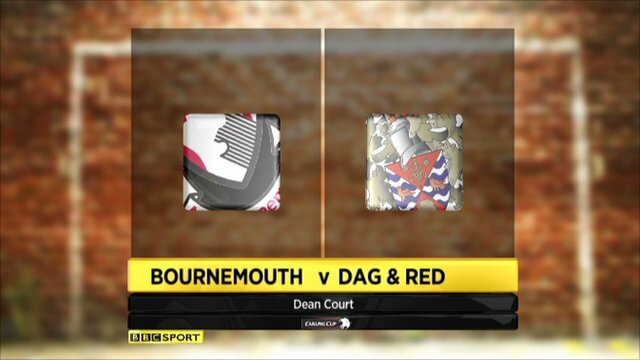 Bournemouth 3-0 Dag & Red. 55:24 Jake Reed has an effort at goal from just inside the box that misses to the right of the goal. 54:43 Liam Feeney produces a cross. 54:10 Centre by Scott Malone. 54:01 The ball is crossed by Marc Pugh, clearance made by Mark Arber. 53:34 Shaun Cooper produces a cross, Scott Doe makes a clearance. 53:14 Short corner taken by Marc Pugh. 53:08 Marc Pugh delivers the ball, Scott Doe gets a block in. 51:52 Foul by Jake Reed on Mark Molesley, free kick awarded. Darryl Flahavan restarts play with the free kick. 50:03 Free kick taken by Darryl Flahavan. 50:03 Substitution Jake Reed comes on in place of Medy Elito. 50:03 The referee gives a free kick against Sam Williams for handball. 49:12 Corner taken by Damien McCrory from the right by-line, Marc Pugh manages to make a clearance. 48:58 Jon Nurse takes a shot. Darryl Flahavan makes a save. 47:23 Medy Elito challenges Mark Molesley unfairly and gives away a free kick. Scott Malone takes the free kick. 45:56 Free kick awarded for an unfair challenge on Scott Doe by Adam Barrett. Free kick taken by James Shea. Correction - 45:26 Liam Feeney takes a shot. Blocked by Mark Arber. 45:26 Liam Feeney takes a shot. Scott Doe gets a block in. 45:00+2:14 The half-time whistle blows. 45:00+1:46 Steven Gregory produces a cross. 45:00+0:32 Marc Pugh delivers the ball, Mark Arber manages to make a clearance. 45:00+0:23 Liam Feeney crosses the ball. 44:24 Shot from outside the penalty box by Luke Howell goes wide right of the goal. 44:16 The ball is sent over by Damien McCrory, Adam Barrett makes a clearance. 43:18 The ball is sent over by Gavin Tomlin, save made by Darryl Flahavan. 42:47 The ball is sent over by Oluwafemi Ilesanmi, Adam Barrett manages to make a clearance. 41:28 Outswinging corner taken right-footed by Liam Feeney from the right by-line. 40:49 Unfair challenge on Scott Malone by Damien McCrory results in a free kick. Free kick crossed right-footed by Marc Pugh, Oluwafemi Ilesanmi manages to make a clearance. 39:18 Centre by Oluwafemi Ilesanmi, Shot from close in by Gavin Tomlin misses to the left of the target. 38:15 Mark Molesley fouled by Abu Ogogo, the ref awards a free kick. Shaun Cooper restarts play with the free kick. 38:04 Damien McCrory takes a shot. Mark Molesley gets a block in. 37:45 Inswinging corner taken from the left by-line by Gavin Tomlin, clearance made by Shaun Cooper. 36:04 Gavin Tomlin takes the inswinging corner, Mark Arber has a headed effort at goal from deep inside the area missing to the right of the target. 35:52 Jon Nurse delivers the ball, clearance made by Adam Barrett. 34:31 Assist on the goal came from Scott Malone. 34:31 GOAL - Shaun Cooper:Bournemouth 2 - 0 Dag & Red Shaun Cooper fires in a goal from just outside the box to the bottom left corner of the goal. Bournemouth 2-0 Dag & Red. 33:51 The ball is crossed by Liam Feeney, Scott Doe manages to make a clearance. 33:23 Sam Williams concedes a free kick for a foul on Adam Barrett. Direct free kick taken by Adam Barrett. 31:57 The assist for the goal came from Lyle Taylor. 31:57 GOAL - Marc Pugh:Bournemouth 1 - 0 Dag & Red Marc Pugh hits the back of the net with a goal direct from the free kick from long range to the bottom right corner of the goal. Bournemouth 1-0 Dag & Red. 31:05 Lyle Taylor fouled by Damien McCrory, the ref awards a free kick. 29:25 Corner taken by Scott Malone, Header from deep inside the area by Adam Barrett goes over the bar. 28:00 Corner taken short by Damien McCrory. 27:41 Adam Barrett gives away a free kick for an unfair challenge on Sam Williams. Free kick taken by Scott Doe. 27:18 Lyle Taylor takes a shot. Clearance made by Damien McCrory. 27:13 The ball is crossed by Liam Feeney, clearance made by Damien McCrory. 23:45 The referee blows for offside against Liam Feeney. Indirect free kick taken by James Shea. 23:11 Centre by Damien McCrory. 22:12 Lyle Taylor takes a shot. Blocked by Oluwafemi Ilesanmi. 21:02 A cross is delivered by Marc Pugh, Scott Doe makes a clearance. 20:53 Steven Gregory takes a shot. Abu Ogogo gets a block in. 20:48 Marc Pugh delivers the ball, Oluwafemi Ilesanmi manages to make a clearance. 19:51 The ball is sent over by Gavin Tomlin. 18:13 Mark Molesley challenges Luke Howell unfairly and gives away a free kick. Scott Doe takes the direct free kick. 16:59 The ball is sent over by Marc Pugh. 15:52 Unfair challenge on Adam Barrett by Sam Williams results in a free kick. Free kick taken by Adam Barrett. 15:34 The ball is sent over by Steven Gregory. 13:59 Lyle Taylor crosses the ball, Headed effort from deep inside the area by Liam Feeney misses to the left of the goal. 13:16 Marc Pugh has shot on goal from just outside the area which goes wide of the right-hand upright. 11:37 Abu Ogogo has an effort at goal from outside the penalty box missing to the wide right of the target. 10:18 A cross is delivered by Liam Feeney, Damien McCrory makes a clearance. 9:38 Liam Feeney is ruled offside. Free kick taken by James Shea. 6:27 Mark Molesley takes a shot. James Shea makes a save. 6:13 Liam Feeney takes a shot. Oluwafemi Ilesanmi gets a block in. 5:51 Inswinging corner taken from the left by-line by Marc Pugh. 5:40 Adam Barrett takes a shot. James Shea makes a save. 4:40 Centre by Marc Pugh, Header on goal by Steve Fletcher from inside the box goes harmlessly over the target. 4:09 The ball is crossed by Oluwafemi Ilesanmi, Shaun Cooper makes a clearance. 3:45 The ball is sent over by Oluwafemi Ilesanmi, clearance by Adam Barrett. 3:40 Gavin Tomlin delivers the ball, blocked by Nathan Byrne. 2:22 The assistant referee signals for offside against Steve Fletcher. Free kick taken by James Shea. 1:52 Marc Pugh takes a shot. Blocked by James Shea. 1:43 Scott Malone delivers the ball, clearance by Mark Arber. 1:07 Oluwafemi Ilesanmi concedes a free kick for a foul on Liam Feeney. Shaun Cooper restarts play with the free kick.